Flyers goaltender Carter Hart stops a second-period shot by Winnipeg left winger Brendan Lemieux on Monday. While many of the Flyers traveled to tropical beaches during their bye week, Carter Hart went back home to the Edmonton area — suntan lotion wasn’t needed — so he could be with family and friends before returning and playing in an AHL game Saturday with the Phantoms. The tune-up obviously kept him in sync. 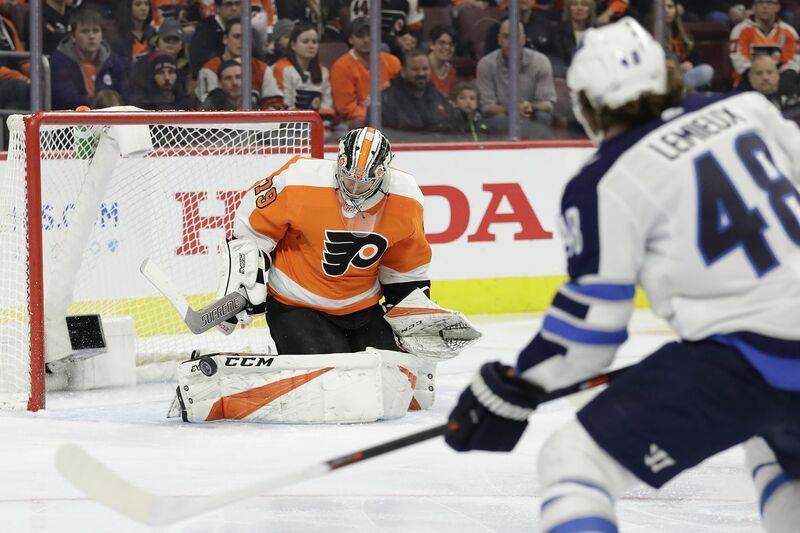 Hart, the impressive 20-year-old rookie, resembled the goaltender who won three straight games before the long layoff as he led the Flyers to a 3-1 victory over gifted Winnipeg on Monday at the Wells Fargo Center. Hart made 31 saves as the Flyers extended their winning streak to a season-high four games and avenged a 7-1 loss to Winnipeg on Dec. 9. Travis Konecny’s 13th goal, scored late in the second period, turned out to be the game-winner. Konecny (two points), playing in his 200th career game, also set up James van Riemsdyk, who finished a slick two-on-one to make it 3-1 with 3 minutes, 35 seconds left. Phil Varone, the AHL’s MVP last season, scored on a rebound with 10:13 remaining in the second to give the Flyers a 1-0 lead. Mikhail Vorobyev, recalled from the Phantoms on Sunday, put the play in motion. From deep in the right circle, Vorobyev found Christian Folin at the point, and the defenseman’s shot deflected off Michal Raffl and went to Varone, who knocked in his second goal in 19 games since being promoted from Lehigh Valley. “Sometimes you just try to get to the net and good things happen,” Varone said. A little over four minutes later, Jack Roslovic tied it as he deftly deflected Jacob Trouba’s point drive past Hart with four seconds left in a Jets power play. Roslovic tipped the puck in the right circle and it bounced crazily past Hart. With 1:14 to go in the second, Konecny gave the Flyers a 2-1 lead. Skating from right to left, he was in the left circle when he deflected Andrew MacDonald’s drive high into the net. Earlier, the pace was slow. Passes didn’t connect. An inordinate number of shots were fired high or wide. In other words, it was a typical first period for teams that had eight days between games because of bye weeks, teams trying to find their rhythm after the layoff. Winnipeg’s best early scoring chances came after it received its first power play late in the first period, but Hart denied stars Mark Scheifele from the slot and Patrik Laine from the left circle in the final minute of the sloppy, scoreless session. Defenseman Shayne Gostisbehere missed the game with a lower-body injury, apparently suffered in the morning skate, and was replaced by Folin. Interim coach Scott Gordon called the injury a bruise and said it wasn’t serious. Gostisbehere might be able to play as soon as Thursday in Boston, Gordon said. … Defenseman Samuel Morin (knee) will go on a rehab assignment with the Phantoms within the next two weeks before playing for the Flyers later in the season, GM Chuck Fletcher said. … Anthony Stolarz (3.90 goals-against average, .880 save percentage) will make his first NHL appearance since Dec. 15 when he faces Rangers backup Alexandar Georgiev (3.43, .895) on Tuesday at Madison Square Garden. … The Flyers will play their final 34 games in a span of just 76 days.